What seems surprising is that, by his own admission, he wasn't alway so good in this situation, via Jim Alexander of the Press Enterprise. "I was awful in those situations at the beginning," he said. "Not just the beginning of my career in pro ball, but even college and high school. I had a tendency to press too much." What explains his sudden proficiency? "It's one of the few situations in baseball where it's always the same. In the third inning I can come up with a guy on second, and there can be tons of different outcomes. But in a late inning like that, with guys on base, one swing is gonna end the game or keep it movin' on. "So you have to stay with the same approach, and that's what I've done -- go up there and want to be the guy and have fun doing it, and believe in yourself most of all." Confidence is what it is all about. Read more of this great interview right here. If you can't get enough of last night dinger, then check it out again below. 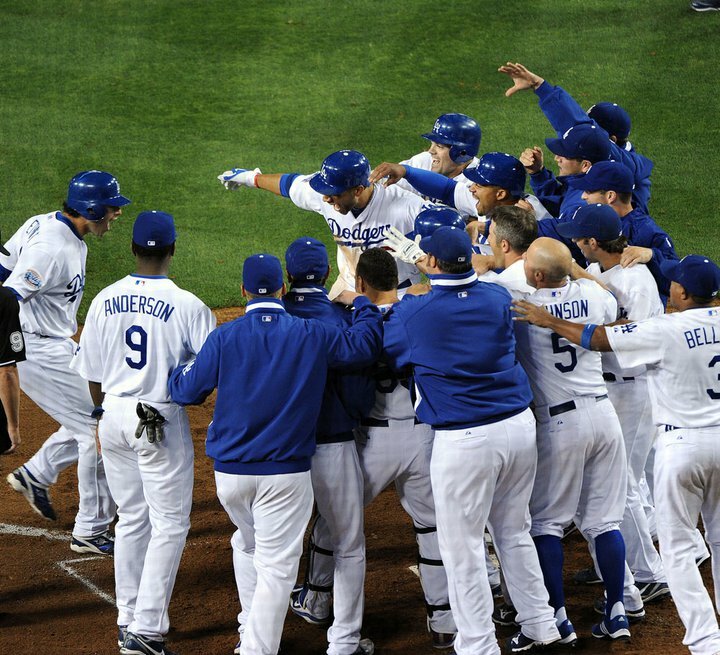 Matt Kemp's "This or That." I wonder who's that lady laughing in the background. Mattingley talks about Jamey Carroll. Trader Joe's loves the Dodgers. Alfred Spink, writer of the book "The National Game" in 1910 said this of Ed Lennox. "He is a fast fielder and base runner and an excellent batsman." Unfortunately, he wasn't quite good enough to stick around. 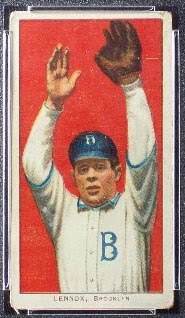 Ed Lennox only spent two years with the Brooklyn Superbas during a Major League career that spanned 6 different seasons. In 1909 he was the regular third baseman for the team and batted .262 with 9 triples, an .695 OPS and a fielding average of .959 in 126 games. Pretty terrible right? Well, if you didn't already know, the Dodger teams of old, especially in 1909, was a very bad team. They finished in 6th place in the National League while having a team batting average of only .229, an OPS of .576 and team fielding average of .955. So, by all accounts, he was one of the better hitters and fielders on the team. Of course, that's not saying much. The next year he batted just .259 while the team batted another lowly .229. That was his last year in Brooklyn. He spent the next couple of years in the minors with Louisville before re-emerging with the Cubs in 1912. Later on, Lennox spent a couple of seasons in the other Major Leagues with the Pittsburgh Rebels of the Federal Leagues. To go along with a Don Drysdale's Dugout mug I featured a couple of years ago is the above (and below) matchbook from his restaurant in the valley. I don't know much about the place other than some unwanted publicity that came up in 1966. That was the year Koufax and Drysdale refused to accept the salaries given to them by the Dodgers and held out together to force the Dodgers to pay them more. Seeing this, Drysdale's employees at his bar decided to do the same thing- demanding higher wages.